Although I, SensitiveHusband, don’t have any food sensitivities, I’ve come to embrace the use of natural, low glycemic index sweeteners. I haven’t cut all refined sugar from my diet, but I have greatly reduced it since SensitiveEconomist discovered her food sensitivities. I didn’t realize how much refined cane sugar was affecting me–a sugar high with higher heart rate and shallower breathing, followed by a sugar low tiredness–until I cut back and shifted my intake to predominantly low glycemic sweeteners. As a cyclist and runner, I find it important to have a drink that combines something sweet and some protein after a workout. Research emerging from Indiana University and the University of Connecticut over the last few years indicates that chocolate milk has the optimal ratio of carbohydrates and protein to act as an excellent post-workout recovery drink. In fact, chocolate milk is as good or better than many of the name brand sport drinks with which you may be familiar. As a result of reading this research and my pleasant experience with low glycemic sweeteners, I decided to create a chocolate milk recipe that is free of cane sugar. 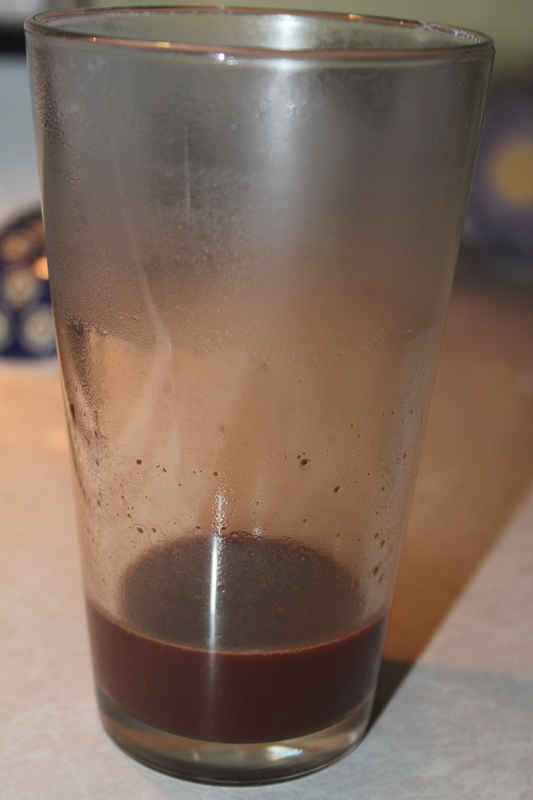 I started with a recipe for homemade chocolate milk, and I adapted it to replace the cane sugar with agave nectar. Honey can be used in a pinch, but agave nectar really works best in this recipe for dissolving in the milk and yielding an almost marshmallowy flavor. While I occasionally have peanut butter and a “no sugar added” fruit juice instead, this Agave Chocolate Milk has become my go-to post-workout drink. Combine the first three ingredients in your glass and microwave for 30 seconds. 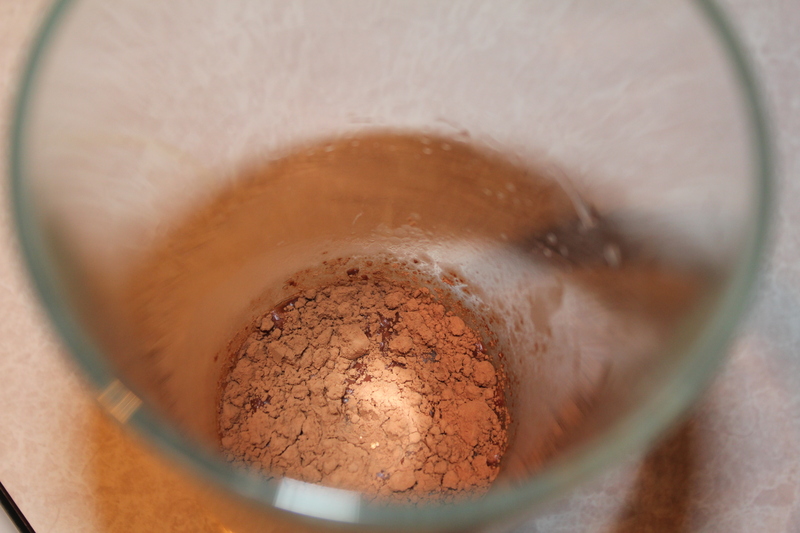 When it comes out of the microwave, swirl the glass rapidly in your hand to insure the ingredients are fully mixed. At this point, you have a homemade chocolate syrup that can be used for other purposes in addition to chocolate milk (ice cream topping, dessert topping, etc.). 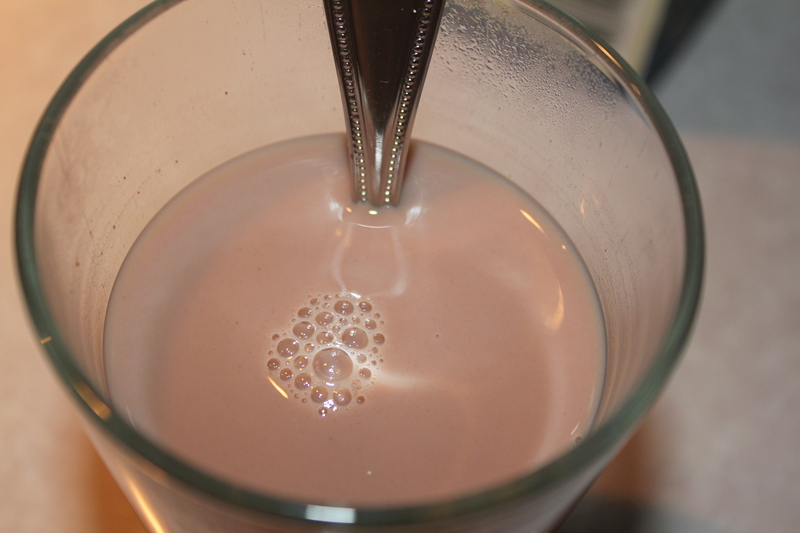 Top off the syrup with milk, stir briskly, and enjoy a very tasty, low glycemic chocolate milk! The next time your children ask for chocolate milk, surprise them with this homemade recipe, and they might not be bouncing off the walls after drinking it! For those who avoid cow’s milk, I would be curious to know if this recipe works well with goat’s milk, coconut, almond, rice, or soy milk. This recipe is being shared with Joy of Desserts, Simply Sugar and Gluten Free, Miz Helen’s Country Cottage, Food Trip Friday and Sweet as Sugar Cookies. This entry was posted in Recipes - Beverages and tagged Agave nectar, Cane sugar free, Chocolate, Milk, Workout. Bookmark the permalink. I am so happy that we can add these recipes to our household’s culinary repertoire. As always, you are the best! I use a similar process to make hot chocolate with soy milk. It is yummy, especially this time of year. I love chocolate milk…Thanks for sharing this. Visiting from FTF. Hope to see you at my blog. A great treat, I just love Chocolate Milk, this looks awesome! Thank you so much for sharing with Full Plate Thursday. Hope you are having a great week end and come back soon! yum…looks delish, Once in awhile I drink hot chocolate when I am too lazy to turn on my coffee maker. Dropping some love for FTF. hope that you can return the favor too. Hi, I love the agave option. Looks delish. I would love it if you came to link to my holiday recipe swap blog hop. It is my first ever! Love these recipes. This was delicious!!!!!!!!! Made enough for a half gallon to last awhile. Love anything to get regular sugar out of our diet. Kids love it too. Thanks!